One of the best life skills to teach a dog of any age is how to settle in the house, or anywhere else you need him to. This is a really easy exercise to teach but one that should be included in your training from the very start of your life together. Start when your dog is already likely to be able to settle - after a walk or playtime is perfect. If you try to do this exercise when your dog is full of energy or is anticipating a walk, you are just setting him up to fail - and why should he settle down when you haven't met his basic need for exercise? 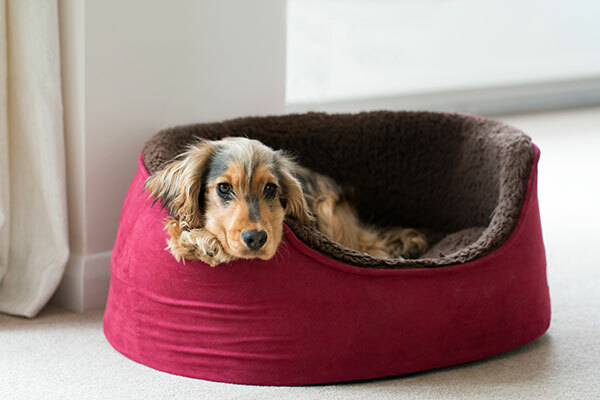 Make sure there is a comfortable spot next to you, either a bed or a fleecy cushion that your dog already likes, where he can lie. Attach a lightweight lead to your dog's flat collar and then either put your foot on it, or attach it to the chair you're sitting on. The lead shouldn't be pulling him on to the floor or even pulling him to be next to you - just make sure it's short enough so he can't jump up on you or wander around and find more interesting things to do. Now sit down and relax. No matter what your dog does, ignore him. He might bark, or chew the lead or pull at it, but just carry on watching the TV until he gets bored and eventually settles. Some dogs do this quickly, while others take longer, but don't be tempted to give him a cue to lie down. You want your puppy to choose to settle down himself. As soon as he does (whether he is on the bed or not), give him a treat as a very clear signal of reward, and continue to reward him on occasion while he is settled. If he gets up, go back to ignoring him again until he settles, and reward him again. If you have a very food-orientated dog, you may prefer to reward him by stroking him or giving him a nice ear rub when he is settled, as he may not relax if he is always anticipating another treat. Or you could give him a stuffed Kong he can chew on while lying down quietly. Do what works best for your dog. Start slowly. Only expect your dog to stay settled for 30 seconds or so before unclipping the lead and finishing the exercise. You can then build up to longer periods. Always vary the length of time so your dog isn't anticipating being released, and is more likely to just settle down and rest. Once they understand the settle, most dogs will take the opportunity to have a snooze. Once your pup has settled of his own accord practise it in lots of different places so you will have a dog who will settle anywhere.